The world's third-largest cryptocurrency by market capitalization fell to $0.424 at 13:00 UTC, surpassing the prior low of $0.438 seen just five days ago on the Bitfinex exchange. XRP has not recorded a daily close below $0.42 since December 12th, 2017. XRP is not the lone cryptocurrency to set an annualÂ low today, however, asÂ it is joined by the likes of OmiseGo (OMG), neo (NEO), litecoin (LTC), and zcash. 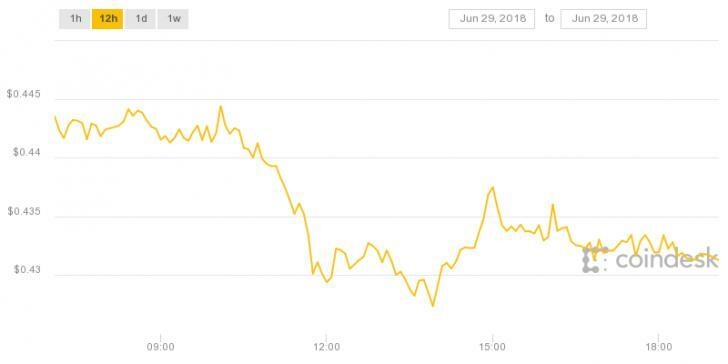 The largest cryptocurrency,Â bitcoin (BTC), came just $14 shy of breaking its annual low of $5,786 earlier this morning, CoinDesk data further indicates. Consequently, the broader market is taking a beating. The total cryptocurrency market capitalization has hit $232 billion - its lowest mark since November of 2017 and a 72 percent depreciation from all-time high just under $830 billion, according to CoinMarketCap.